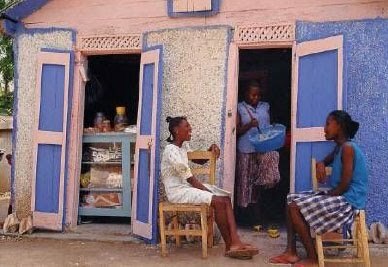 With all of the recent interest in helping to rebuild the fallen built environment in Haiti, I would like to recommend an excellent resource for understanding how the Haitian culture has been reflected in their architecture over the years. Haitian Wisdom is a 29-page PDF document written by Patti Stouter that is very well researched and presented with many illustrations. Anyone planning to offering shelter, either temporary or permanent, would be well-advised to review this informative document. Well meaning aid groups often falter when they produce solutions for shelter that do not take into account the sort of cultural factors that are clearly defined here. Inappropriate shelter is often simply abandoned or never occupied because it doesn't fit the culture. "Traditional communities are combinations of buildings that have developed slowly from the values and knowledge of the local people. The signals and symbols of social status or other meaning may seem subtle to outsiders, but they are obvious to residents. Existing vernacular areas may seem random to designers from Anglo or European cultures. But they often display a brilliant use of appropriate space and sheltering for transitions from the private space of the stoop, to informal neighborhood gathering spaces like public water supplies, to the more public market places." includes space for flowering bushes, herbs, and a few vegetables. Animals are penned and cared for. Food is dried and stored in a roofed silo that is raised above the ground. These uses are basic and must be provided appropriate space that is large enough and comfortable enough for work." This little booklet is an enjoyable read, even if you are not involved in relief work in Haiti, just from a cultural point of view, to understand how culture and architecture blend.